THE STRUGGLE is on to protect the local government pension scheme. On average 82% of members voting in the ballot for industrial action have supported action, with 28 March set to be a strike day. The significance has been recognised by the membership of the national trade unions with members in the scheme which have campaigned successfully for the vote. This must be the first step to defending pension schemes. Some specialist unions like the Association of Educational Psychologists held their first ever national strike ballot on this issue and recorded a 77% yes vote. 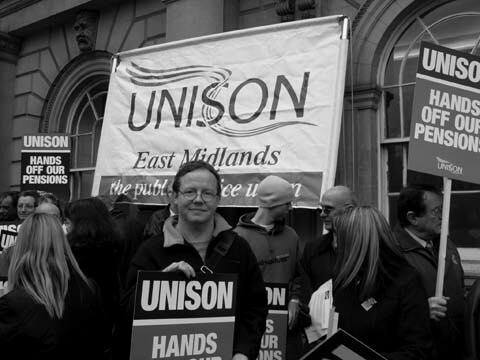 Everyone has their role to play in this dispute, with smaller unions taking their place and often leadership alongside the large unions. The struggle is far more important than any individual union or negotiator. But no union should underestimate the work that will need to be done to engage members in the action. A national coordinating strike committee of all unions has been formed, called the Joint Union Strike Team (JUST), and this is to be replicated at a local level. Joint publicity material is being produced, and joint activities planned. The unions are determined to maintain the unity shown so far and are putting the struggle before any vested interests. Some new relationships will and should be sustained for the future round of the struggle. The unity should be developed not just for this struggle but also for other fights on the Private Finance Initiative, against cuts and to protect services. The employers act as one, so should the movement. Marching against pensions, last year...before the election. The fight now has to be protracted, and guerrilla. The parallel approaches of firm negotiations, campaigning and sound preparations for action have been under constant discussion among the negotiating team. Even if the dispute incredibly reaches a settlement by the time you read this, the unity achieved between the unions concerned has been a significant development. European Union-led assaults on the level of pensions, as frequently analysed in Workers, lie behind a significant new attack on the gains of the past and the prospects for the future. The general attack on pensions whether in industry or public services represents the depth of capitalism's decline and the great difficulty it poses for tactics in opposition. Government, representing capitalism, does not care about the future of workers. It is abandoning us, along with Britain. Tactics deployed so far by the negotiators in this dispute have of necessity been varied. Above all, they have had to take account of the fact that a two-tier system such as that accepted by the Public Services Forum, imposing worse pensions on new recruits, is unacceptable to the members. This time, any settlement will have to be put to the membership first before acceptance. The threats of legal action and attainment of expensive legal opinion have been used to complement threats of industrial action not as alternatives. They recognise that industrial action is only part of the tactics that unions will need to use in order to stave off these attacks and more in the future. The unions have argued it out together to unite, while successfully dividing the employers. Minister has been divided against minister, the Local Government Association divided from its members as employers' organisations in Scotland and Wales have supported the union side along with the larger local authorities like Greater Manchester, West Yorkshire, Merseyside and others. The government is using the EU directives supposedly against age discrimination to attack pensions, claiming that the EU directives on age discrimination demand an end to the 85 year rule (that workers with 25 years' service can retire at 60 on a full pension). But the very concept of a pension is obviously based on age. The buck stops with the government, which through the Office of the Deputy Prime Minister can make the final decision. So this is a big argument with government. It stands isolated in trying to reduce the value of pensions generally. Its obsequious response to EU directives to slash pensions has been willingly made. The Department for Work and Pensions' document on pensions testifies to this (see below for web reference). The plan is to push the retirement age up and up. More like the Department for No Work and No Pensions. The employers are looking for a fight, with the aim of breaking the power of public service unions. The attack already carried out through picking off and privatising individual services such as parking and catering, leaving us weaker, is to be pushed to its logical conclusion over this issue. They want a big set-piece battle. We will have to box clever to prevent this from happening. Actuarial reports commissioned by the union side have blown a crater in the government's technical and financial arguments. There should be no truck with arguments that our pension scheme is in deficit because we are living longer, or that we need to be careful because workers in the private sector are much worse off than those in the public services. The unions have taken on the employers on some of their own ground to defeat their positions. Literally tens of thousands of different employers have become embroiled in this outside local government and the unions are using this. Workers who voted to act have recognised that there must be a fight. The struggle is about not allowing a halt to the momentum that has been created around the pensions question. Capitalism is saying in future, work longer, and harder, pay more into your pension and earn less at the end. In many areas it is abandoning pension schemes completely, not just going on holiday but emigrating. Trade unions collectively are making a first small step towards saying that enough is enough. The challenge is not just to stave off these attacks but to keep the pressure on to make up the ground lost. Now workers need to meet in their workplaces to determine tactics locally. The question is, how do we hurt the employer with minimum damage to ourselves? The day of action is a good start, but what next? Where are we strong, where are they weak? This might differ from workplace to workplace. For instance, councils are gearing up to collect next year's council tax. Council finance departments handle millions of pounds of money. Council mail workers are needed to ensure council tax demands go out on time. Maintenance workers are needed to keep buildings open. The fight will need to be guerrilla, protracted. We need to be in it for the long haul, to divide the employers, gain ground inch by inch, and win new allies and troops for the next rounds. A national strike committee has been formed and preparations have been made for a national levy. The intention is that no one single union is going to sustain its members while others cannot and thus create divisions. Without securing and improving current arrangements there is no hope for the future. Unions have revealed that there is ample money (our deferred wages) in the government kitty to improve the scheme for the future. Employers and government prefer employers' pension holidays and a general level of reduction in the scheme, with a view to eventual abandonment of the notion of any retirement age with a pension. They are not satisfied with the pensions holidays they previously enjoyed, they now want the workers to pay for the shortfall. Our class should not pay for the greed of the employers in the past. Capitalism is giving up on British workers. The only possible future will be the one we fight for now. • The government document "United Kingdom National Strategy Report on Adequate and Sustainable Pensions" can be found at the DWP web site.